Once you’ve edited your portfolio you can share it via email, Facebook, LinkedIn, Twitter, or use a pre-populated embed code. 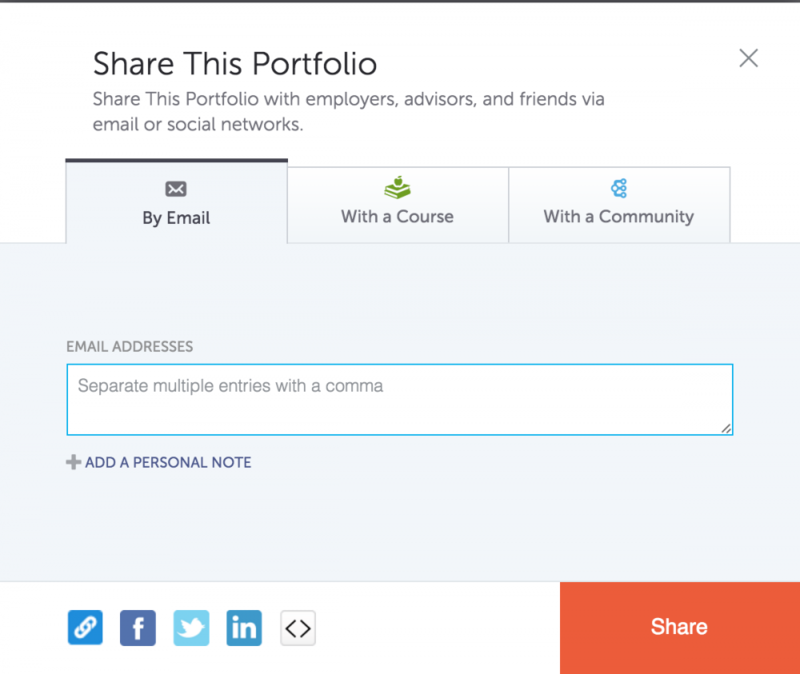 You can also choose to share your portfolio with a course you’re enrolled in or a community. For personal portfolios, you are able to share using a custom link created for a specific audience, enabling you to track who views your portfolio in the View Insights panel. Click the Share button to share your portfolio. 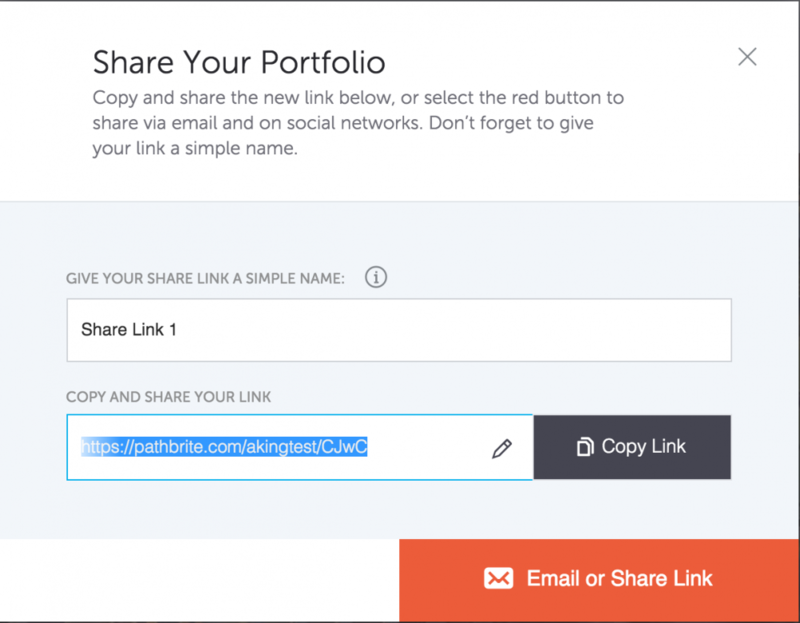 A modal will appear where you can name and create a custom link to your portfolio. Note: this is only for personal portfolios and this function is not available on Course or Program portfolios. Once you’ve named and edited your link, you may click the Copy Link button to copy the link to your clipboard, or you can click Email or Share Link for more options. 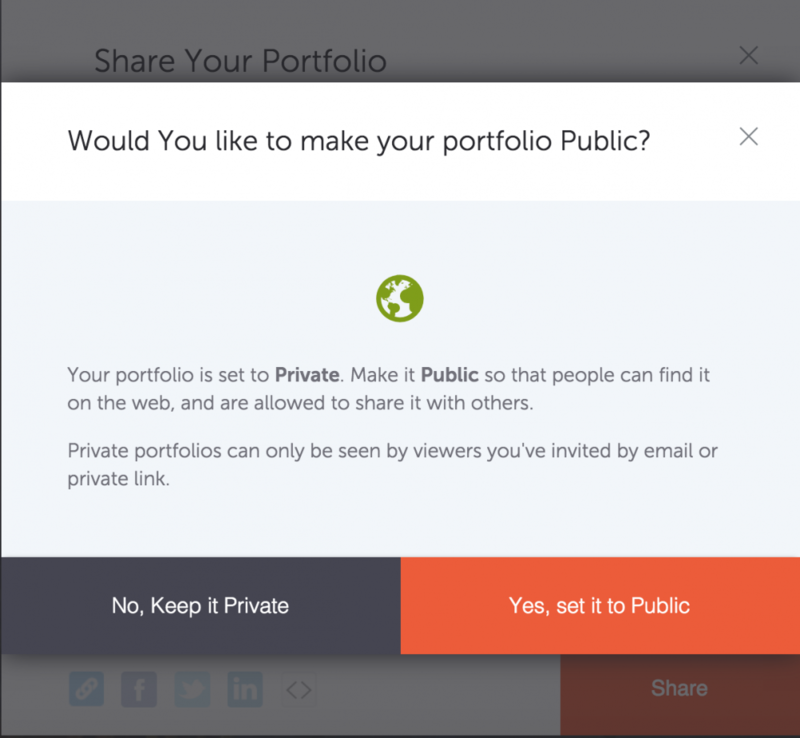 Clicking Email or Share Link will bring up a new modal, where you will have several options for sharing your portfolio. If your portfolio is Private you will be able to share via email, and whomever you email that custom link to will have access to your portfolio. If you set your portfolio to Public you will also be able to share your portfolio to Facebook, Twitter, and LinkedIn as well as embed it into a website using the embed code. Setting your portfolio to Private means viewers must have a link to your portfolio in order to view it. Click Set to Public and your portfolio will be made public. Setting your portfolio to Public means your portfolio can be shared publicly on social media and viewers can search your portfolio on search engines. 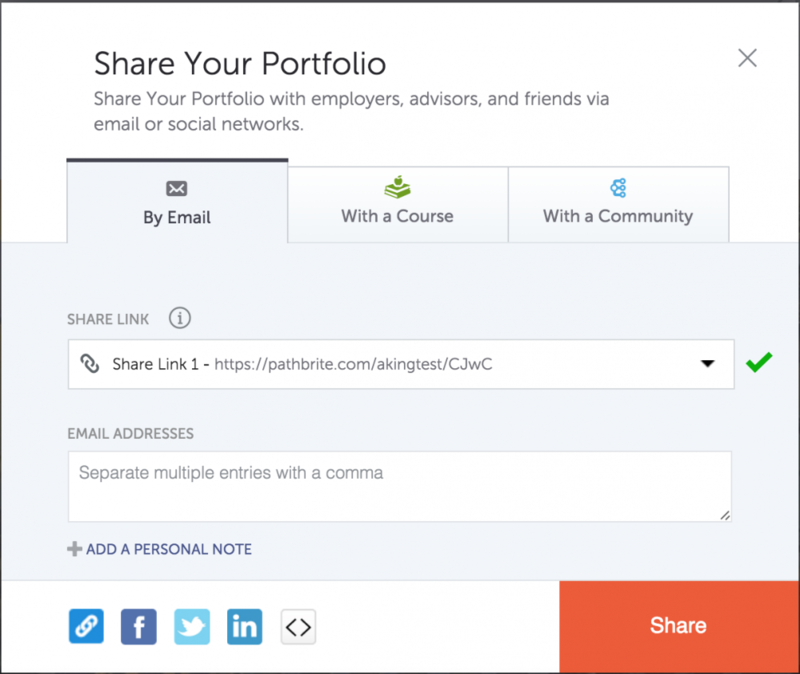 To share a course or program portfolio, while viewing your portfolio click on the Share button in the top right of your screen. 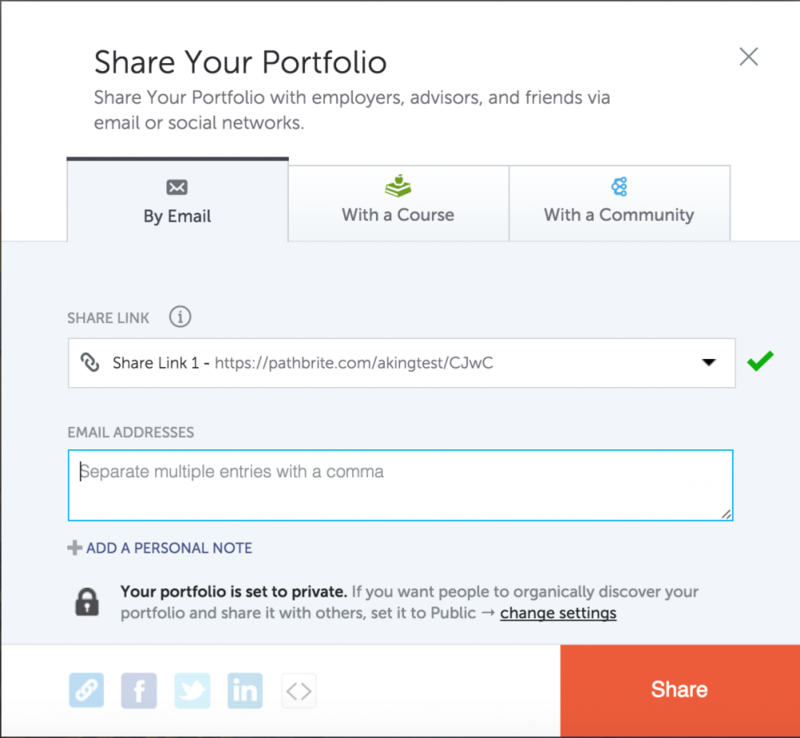 You will have the option to share your portfolio via email, with your entire course, or with your institutional community.